Do you love nuts? I do! 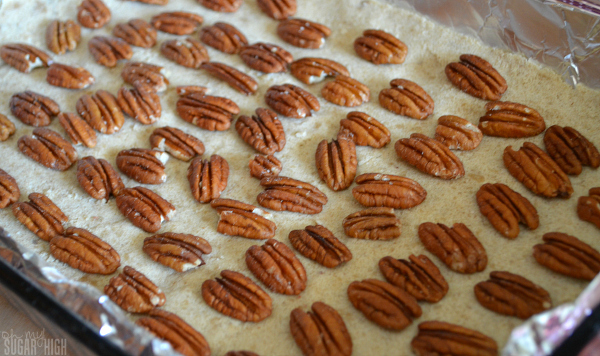 When it comes to baking, pecans are definitely my nut of choice. My oldest son has his piano recital tomorrow, and we have to bring a treat to share. 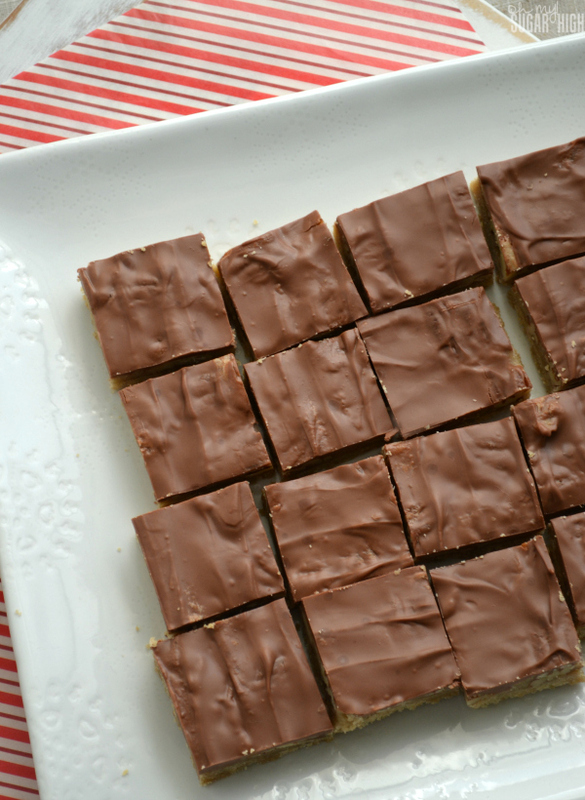 I decided to make these homemade turtle bars which are extremely easy to transport and take very little time to make. With the holidays in full swing, recipes which still are homemade but take very little time to prepare are winners in my book. Cookies are classic, but can be a time commitment. Bars are a great alternative! I found this recipe at Taste of Home, and I’ve only made small changes. Why mess with a good thing? In large bowl, beat softened butter and sugar until well combined. Gradually add flour and beat until mixture is crumbly. 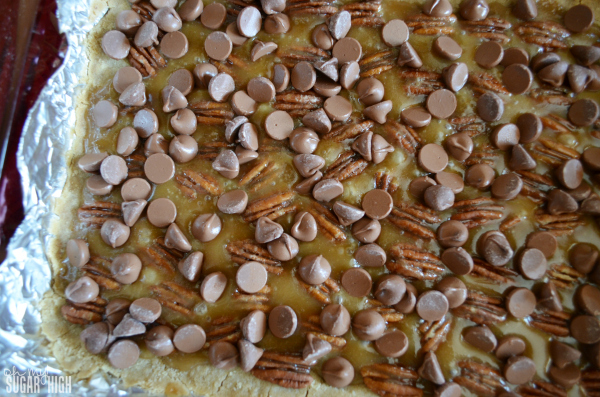 Add pecans over crust, arranging them so they don’t overlap. To create topping, melt butter and brown sugar in a medium saucepan. Bring to a boil. Continue to boil for one minute, stirring constantly. Pour butter mixture over pecans. Bake at 350° for 18-22 minutes or until bubbly. Transfer to wire rack. Sprinkle chocolate chips on top. Allow to cool in pan a few minutes to melt. (If you are in a hurry, you can return the pan to the warm oven for a bit.) Spread melted chocolate chips over top to create chocolate layer. Remove from pan, pulling up sides of aluminum foil. I used Ghiradelli milk chocolate chips, but any chocolate chip would work just fine for the topping. Because I used aluminum foil, I was able to lift these bars out before cutting. I love how easy these bars are to cut, once they’ve have a chance to cool. 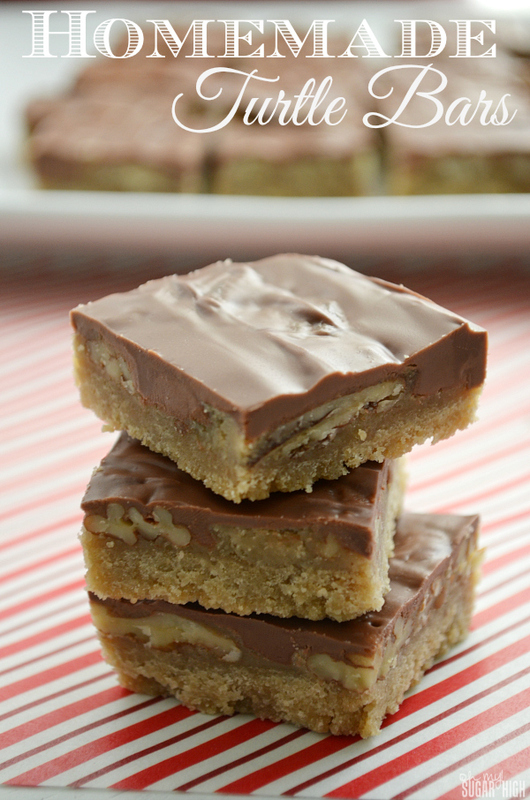 These pecan treats are a bit on the sweet side, so a single pan can go far! They also make a great addition to any holiday treat tray or to give as gifts. Hope you are enjoying the holidays and find some time to get into the kitchen and bake something delicious for your family! These sound so yummy! great for presents, would you be able to use any nuts, not just pecans? 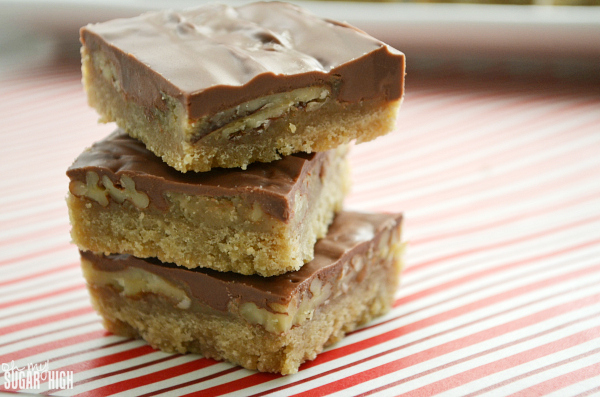 Mmmmm… Caramel and chocolate. FABULOUS! I can’t wait to try these. Pinning! Thanks for linking up with #FoodieFridays this week! Oh my. I am needing something tonight to give as a gift tomorrow to someone special. These are so perfect. I hope they last until I can give some away! LOL!